Want to build more trust with your customers? Have you ever admitted a mistake you’ve made in your business? Your ability to establish customer loyalty depends on your ability to show full transparency -- which includes your mistakes. 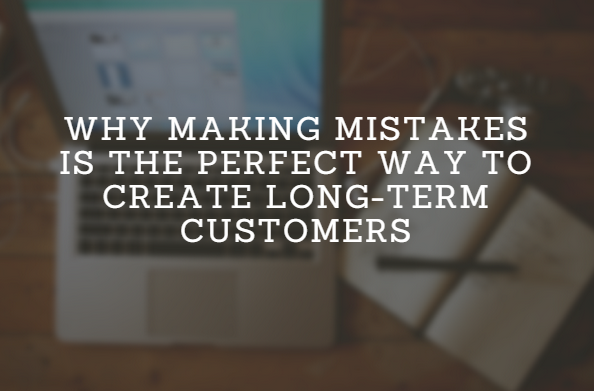 In this article you will discover why making mistakes is actually the perfect way to build customer trust, and how it can benefit your business. Let’s face it -- no one is perfect, and this same truth applies to the business world. With that said, it’s only natural that as a business we are bound to make the odd mistake no matter how big or small. Showing authenticity simply means having the ability to be genuine in both your business practices and your customer service, which includes admitting any mistakes you have made along the way. Besides making mistakes, your business can also showcase its authenticity through storytelling. This means ensuring your story is an accurate representation of how you do business and its origins. Your customers today are more knowledgeable than ever before, and they will find out and share this experience if you try to hide any aspect of your business you shouldn’t. Honesty is the best policy when it comes to loyal customers. Admitting to mistakes increases trust as it shows your business has nothing to hide. While we all view making mistakes as a bad thing, it does have its positives -- especially when it comes to your customers. Admitting to mistakes your business has made allows your customers to see the more human side of your brand. With regards to customer service, it helps to prevent any further frustration from your customers. Instead of ignoring any issues at hand, simply opening up and admitting to any mistakes you have made shows your customers you are willing to take responsibility for your actions and are working towards correcting the situation. While this approach may not please 100% of your customers, it presents them with a reason for any issues caused and lets them know you’re a business they can trust, as you openly admit when errors have been made. This increase in trust helps to strengthen the relationship with your customers, which leads to higher confidence in your business, and ultimately, an increase in sales. Mistakes in your business are a great way to identify areas for improvement. While market research can be a good indicator on how your customers will receive your product or service, nothing will beat experience. It’s this experience that will help you to identify areas where you can better serve your customers’ needs or improve their user experience. Identifying these mistakes may also help to outline new areas your business may not have considered. This is why your business should welcome any mistakes it comes across and view these as valuable feedback rather than a nuisance that needs to be fixed. Your customers are your greatest source of learning. While you may notice mistakes made in your business, your greatest source of learning is actually your customers. They will be the first ones to let you know what is working and what isn’t. One of the main reasons for this is because they interact with your business on a regular basis and have gone through the whole process from prospect to purchase. That is why it’s important for your business to monitor any mentions and conversations from customers for feedback. This helps to increase your knowledge as a business, as it allows you to get valuable data on how your customers are using and interacting with your product, service or site. It’s also important to note that not all customer feedback is external. Your employees are also a great source of learning when looking to highlight any mistakes, as they are able to identify both internal and external mistakes in the business. They are also customer facing, and therefore are in the best position to evaluate feedback. Acting on customer feedback helps to create a product/service in line with customer expectations. Listening to customer feedback with regards to what can be improved, or any mistakes made, is only half the equation. To truly build that trust with your customers, you want to ensure you take action and implement the suggestions or feedback that’s been received. This serves to provide two core benefits -- the first being that your customers feel valued, as you have taken the time to listen to their views and feedback, and the second being that customer feedback is a great indication of what your customers expect from your product or service. You want to ensure you gather this type of feedback on a regular basis, as this will help to ensure your business is always creating demand in line with customer expectations -- be it your website design, sales process, or even product or service features. Lastly, no matter how much research you carry out, sometimes putting your product or service to market and testing it with your customers is the best indicator on performance. This doesn’t just apply to new products or services, but also new features or any small changes made. Your customers -- both internal and external -- will then be the first ones to help you identify any mistakes as well as what has worked well. The benefit of testing your new changes with your customers is the fact that it helps your business to identify areas for improvement that it may have missed, or hadn’t thought of yet. This allows your business to think of new and innovative ways it can help deliver those needs to the customer. That is another reason why your business should never wait for perfection when creating assets for customers, be it a website, product or even a sales process. The truth is your customers’ needs are always changing, so it’s better to make mistakes and improve than to wait for perfection and delay action. For more actionable ideas to help you deliver exceptional service that delivers customer trust and customer loyalty, download our 20 Customer Service Best Practices E-book.